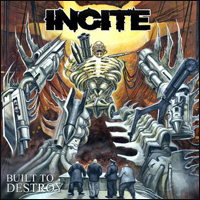 On Built to Destroy, Incite stick to their tent poles, propped up on groovy riffs and angsty vocals. There are plenty of great riffs and grooves to be had, but the pacing from one song to the next could be improved, and few riffs could’ve benefited from some more room to breathe. Regardless, Built to Destroy shows Incite throwing some hard punches. The album includes guest appearances by Kirk Windstein (Crowbar) and Chris Barnes (Six Feet Under) and is certainly a worthwhile addition to their discography.